BURLINGTON, Wash. -- The 20-year-old suspect in the deadly Washington state mall shooting said nothing and appeared “zombie-like” when he was arrested by authorities nearly 24 hours into an intense manhunt, authorities said. 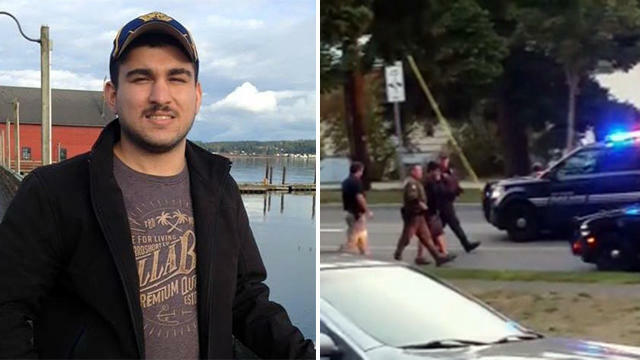 According to CBS affiliate KIRO, that Skagit County court records show three domestic-violence assault charges against Cetin. The victim was identified as Cetin’s stepfather. The Seattle Times reports​ Cetin also was arrested for drunken driving. Cetin was told by an Island County District Court judge on Dec. 29 that he was not to possess a firearm. The court was told it was not clear were Cetin would be staying. However, the stepfather urged the judge not to impose a no-contact order, saying his stepson was “going through a hard time.” A formal no-contact order was entered for each parent, according to court records. Cetin was involved a misdemeanor fourth-degree assault case in Island County, Washington. He was reportedly ordered to undergo a mental health evaluation in August 2015, and that was completed as of March 2016, KIRO reported. As of Aug. 25, 2016, Cetin was in compliance with weekly sessions for mental health counseling. He complied with the alcohol assessment, according to court records, and he had a deferred prosecution review for a case involving a marijuana scheduled for 2018. Social media accounts apparently belonging to Cetin show he had a fondness for the military and video games. A Twitter account shows, among other things, various selfies, throwback photos of the 20-year-old in younger years, that he once participated in paint ball and that he “can’t wait for Halo 5,” the popular first-person shooter video game. He also Tweeted “Shout out to the ROTC peeps.” A Facebook account showed he liked military-related sites. Authorities are also searching an apartment connected to Cetin. Washington State Patrol Sgt. Mark Francis said Sunday morning in addition to going through the Oak Harbor residence tied to Cetin investigators are searching his vehicle. Francis said authorities don’t yet know who is on the apartment lease or how long Cetin may have lived there. Authorities said four women, ranging in age from teens to seniors, died Friday in the mall shooting at the Macy’s makeup counter around 7 p.m. A man who was wounded in the shooting died early Saturday, officials said. One of the victims has been identified as Sarai Lara, 16, according to KIRO. The Seattle Times reported Sarai Lara’s mother said she had survived cancer as a young girl and was a happy student. She says Sarai went to Macy’s looking for pants. The mall was packed Friday night when the gunman opened fire with what police described as a “hunting-type” rifle. Victims described chaos on the scene as police locked it down and tried to clear the area.